Talion, destroyer of Uruks at your service. As the credits roll on Shadow of Mordor, a sense of satisfaction and accomplishment suffuses me in a way other games have been lacking recently. (I’m talking to you, Destiny!) After thirty hours of wandering the bloody wastes of Sauron’s kingdom, Talion and I did everything we could to stem the tide of war coming to Middle-Earth, but as everyone knows, true evil cannot be defeated so easily with a sword and cool Wraith powers. To say that this game came as a surprise to many (including myself) would be accurate, as the majority of the games based in Middle-Earth have been either disappointing (SNES Lord of the Rings) or shallow (The PS2 movie tie in games). So what made this game such an awesome experience that I think everyone should play? Two words: Nemesis System. Most of you may have heard the developers talking about this new gameplay mechanic during demos of the gameplay, but to actually see it in action myself makes me really appreciate how intricate the game’s mechanics are. To put it simply, the army of Sauron has several unique enemies with special abilities and weaknesses to exploit, all seemingly randomized and with a staggering amount of unique dialog that is also dynamic and based on your interactions with each individual enemy. For example, early on I was a bit underpowered and attempted to kill a captain who was a bit more powerful than I was, and, well, I died several times at his hand. Those bodies are of those I deemed unworthy. 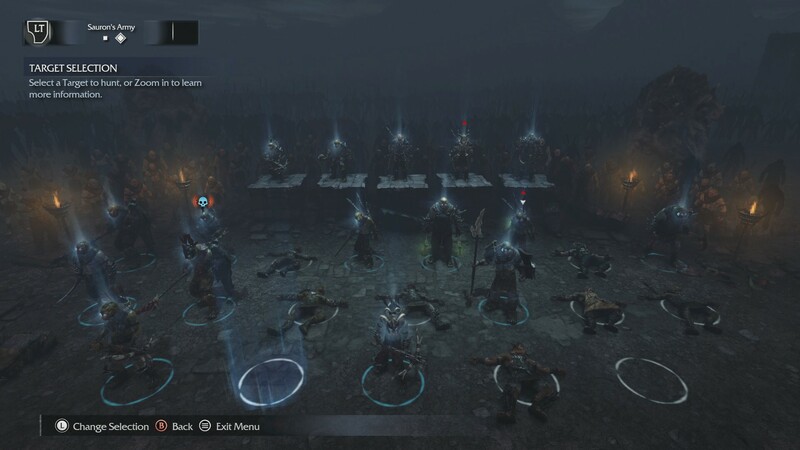 While dying in most games means restarting from a save or checkpoint, in Shadow of Mordor it means the Uruk who “killed” you gets a nice power boost, thus making him even more difficult to kill should you immediately try again. In addition to the power boost for your killer, the rest of the army resolves several random events occurring on the map. These events range from hunting beasts to recruiting more troops and even dueling other captains in power struggles, all of which you can directly get involved with. In the beginning all you can really do is kill these captains, but at a certain point in the game you obtain the power to dominate the captains and make them your servants, which opens up some really cool strategic options when it comes to taking down the Warchiefs. My most memorable experience came when I encountered a Warchief who happened to have three bodyguards I had previously bent to my will. I then had them turn on him during our confrontation, which made that fight much easier. Which brings me to the actual combat in the game: modeled after the Batman Arkham titles, you have the ability to take on large groups of enemies with ease. However, the unique thing about the combat here is that while you are trying to take on one particular captain, it isn’t uncommon to have another captain show up in the middle of your combat and want to make a name for themselves with your death as well. In addition to the base combat, you have several special abilities as well as unique attacks that you can unlock which increases your survivability in combat and even a few that make moving around the maps (there are two main areas) much faster. If I have one small complaint about the game, it’s that all of the upgrades should have been in a single menu as opposed to separate menus for your weapon runes and the actual character upgrade abilities. 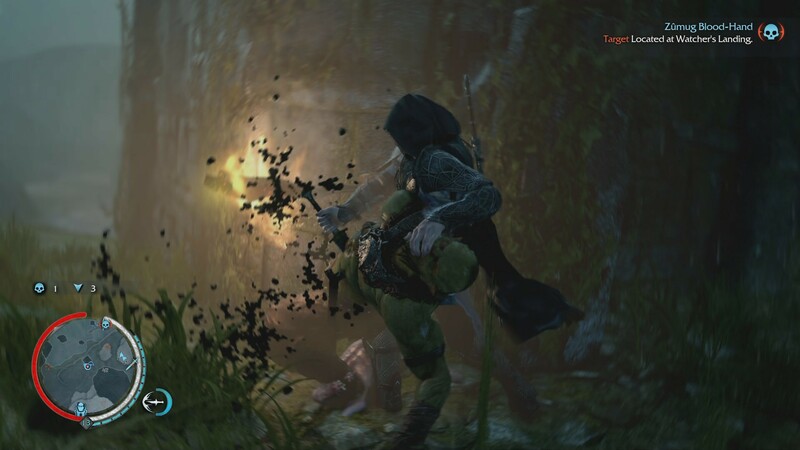 This is a minor quibble though, and one that won’t detract you from exacting revenge on every Uruk in Mordor. The world itself is broken up into two maps: the realm of Udun with the Black Gate, and Nurn, which apparently was the fertile land enslaved by Sauron in order to feed the massive orc armies. The trip to Nurn was a nice change of pace, as Udun was the typical desolate and dark place. It appears the game takes its cues from the movie universe, with the Uruks and humans all having the “Peter Jackson” look through and through. Even Gollum makes a brief appearance in the game, and at first I thought it was Andy Serkis doing the voice of the tortured creature. Getting around the world is also a snap, since the several towers dot the landscape that act as fast travel locations, although in some cases the towers seemed a bit too spread out. The story managed to be engaging even if the outcome of all of your actions means little in the grand scheme of the mythos of Middle Earth. 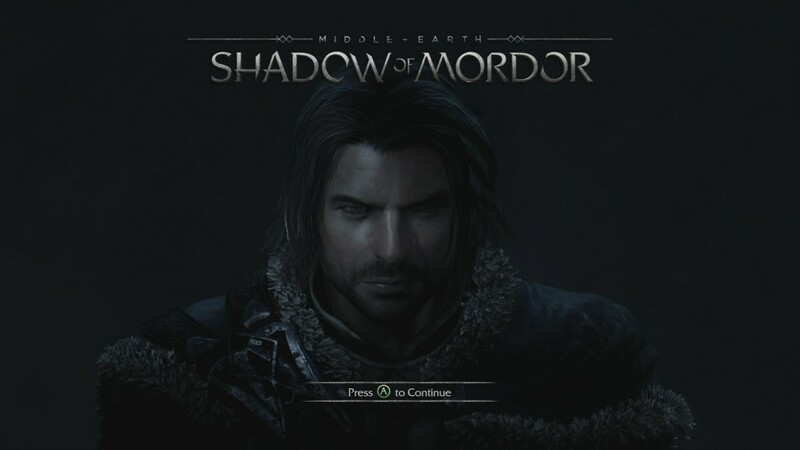 Set in between the events of The Hobbit and Lord of the Rings, you play Talion, a Ranger of Gondor who is stationed at the Black Gate when the forces of Mordor return in full force to prepare the land for Sauron’s coming war. After watching your wife and grown son sacrificed by The Black Hand, you are “killed,” but as fate would have it, you cannot die. This is all explained to you by a being introduced as The Wraith, whose fate you later come to learn is directly tied to Sauron on his rise to power. Learning the history of this character was surprisingly interesting, and his tragic tale is well told. Another nice touch: the backstory of your character is told through voiceovers that occur during the loading screens, which seems odd, but I like that they actually used that time to add significant backstory to the characters. As someone who is a pretty big fan of Middle-Earth, I can honestly say this is my favorite use of the license yet, and I’m hopeful that Monolith has some other unique ideas for where to take this system going forward. A lot of times the first game in a new franchise seems like a proof of concept (I’m looking at you, Assassin’s Creed) but by taking bits from already existing titles and then layering on the wholly unique Nemesis System, they have created something extraordinarily entertaining and well worth your time to finish. I may even pick up the season pass for the game, as I’m curious to see what additional content they can add.